That said, home buyers and sellers in the South Orange County area should be cautious when referencing the Case-Shiller Index. The index is a flawed metric and, as such, can lead to improper conclusions about the housing market overall. 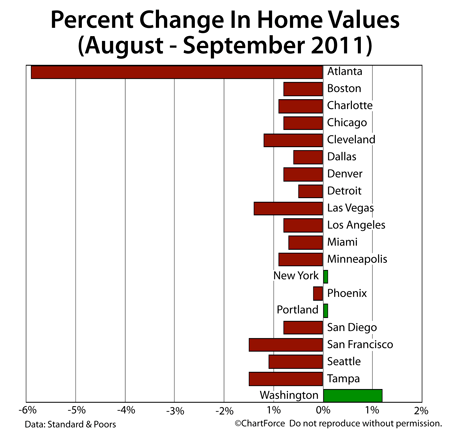 If you plan to buy of new construction in California sometime in 2012, don’t expect today’s low prices. Like everything in housing of late, the market for newly-built homes appears to be stabilizing and, in some markets, improving. Mortgage markets worsened slightly last week through a bouncy, holiday-shortened trading week. Markets were closed Thursday for Thanksgiving and re-opened only briefly Friday. As in past weeks, though, economic, political, and financial news from the Eurozone dictated the direction of U.S. mortgage-backed bonds. As Greece — and now Italy — have faltered, investors have sought to preserve their respective principal, moving money from unsafe assets to safe ones, a class which includes Fannie Mae- and Freddie Mac-backed mortgage bonds. This investment pattern is known as “safe haven” buying and it’s why mortgage rates tend to improve when large economies grow unstable. Government mortgage bonds are considered among the safest securities available. The average 30-year fixed rate mortgage is available for 3.98%, according to Freddie Mac, with borrowers expected to pay an accompanying 0.7 discount points. 1 “discount point” is a loan fee equal to 1 percent of your loan size. “No-point loans” carry higher rates than the Freddie Mac-published figures, but come with lower closing costs. This week, there are several reasons to expect mortgage rates to rise throughout California. First, markets are speculating that the IMF will lend Italy 600 billion euro to help avert financial crisis. This move would reverse the safe haven buying that’s characterized the last few weeks of trading, thereby leading mortgage rates higher. A second reason is that they are early reports that Black Friday shoppers out-spent analyst estimates. Consumer spending is the largest part of the U.S. economy so, if spending is up, the economy should be up, too. As before, this would reverse some of the safe haven buying that’s helped keep mortgage rates low. 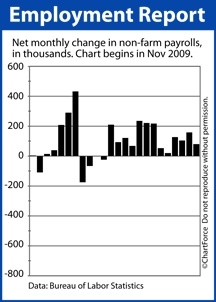 Lastly, this week is stuffed with new data including Friday’s always-important Non-Farm Payrolls report. Wall Street expects 116,000 net new jobs created in November. If the actual figure is much higher, mortgage rates will rise. Expect mortgage rates to be volatile this week. Your quoted mortgage rates could vary by as much as a quarter-percent from day-to-day. If you’re nervous about losing a low rate that’s been offered to you, consider locking in. Verify your local conforming loan limit and loan limits across California via the Fannie Mae website. A complete county-by-county list is published online. For today’s Coto de Caza home buyer, October’s Existing Home Sales may be a “buy signal”. Supplies are falling and sales are increasing. Elementary economics says home prices should begin rising, if they haven’t already. Comments Off on More Sales, Less Inventory : Home Prices Headed Higher? For home buyers in Coto de Caza and nationwide, FHA-insured mortgage offer several advantages over comparable conventional loans, the most commonly cited of which is that FHA-insured loans require a down payment of just 3.5 percent. Mortgage markets went unchanged last week as Wall Street traded on new debt stress within the Eurozone, and stronger-than-expected economic data here at home. Rates moved very little from Monday to Friday and the storyline’s not expected to change much this week for today’s rate shoppers. According to Freddie Mac, conforming 30-year fixed rate mortgages remain priced at 4.000% with 0.7 discount points on average, where 1 discount point equals one percent of the loan size. For people who prefer “zero-point” mortgages, expect a mortgage rate above 4.000%. By contrast, loans with 1 point or more are priced below 4.000 percent. However, in this holiday-shortened trading week, mortgage volatility should be up, and rates may finally break from the 4.000 benchmark we’ve hovered since November 1. What’s unclear is whether rates will rise or fall. For 8 months, we’ve talked of how events in Greece have influenced the U.S. mortgage market and, how each time Greece moved to the precipice of default, the U.S. mortgage bond market improved, causing mortgage rates to fall. Last week, similar default concerns emerged for Italy and Spain. This applied downward pressure on U.S. mortgage rates, but a strong retail sales report; a better-than-expected New Home Sales data; and soaring homebuilder confidence renewed talk of domestic inflation in 2012 and beyond. Inflation erodes the value of the U.S. dollar and leads to higher mortgage rates. In addition, Wednesday marks the deadline for the congressional “super-committee” tasked with finding $1.2 trillion in federal budget savings over the next 10 years. The committee was formed in the wake of August’s downgrade of U.S. federal debt by Standard & Poors. If Congress fails to meet its goal in time, stock markets should suffer and mortgage rates may fall. Housing Starts Rising; New Construction Turns The Corner? Another day, another signal that the market for newly-built homes is improving. Single-Family Housing Starts rose to a seasonally-adjusted, annualized 430,000 units in October – a 4 percent increase from September and the highest reading in 3 months. A “Housing Start” is a home on which ground has been broken. The increase in surprised Wall Street analysts, although it shouldn’t have. Earlier this week, the National Association of Homebuilders showed that Homebuilder Confidence is at its highest point since May 2010, the effect of better market conditions and more sold units. Rising housing starts amid a lift in builder confidence is to be expected — the two metrics have moved with loose correlation since mid-2000. Buyers of new construction in Trabuco Canyon can infer two key points from last month’s data. First, with more homes will being built, home supply should rise, thereby softening pressure on rising home prices. This should help keep homes affordable. However, the second point is that, with builder confidence rising, buyers are less likely to win price concessions and “free upgrades” in negotiations. 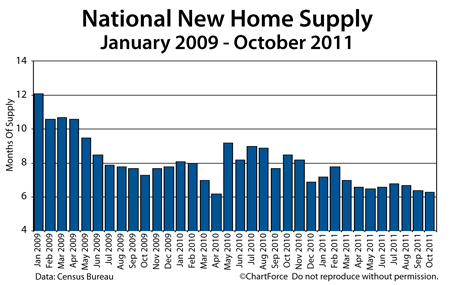 The last 6 weeks of 2011 may be your optimal time to buy new construction. Home prices remain affordable and mortgage rates are rock-bottom. In addition, because there are typically fewer active home buyers during the holidays, you’ll be more likely to locate one of the few remaining new construction “deals”. Talk to your real estate agent about local trends and new construction. Comments Off on Housing Starts Rising; New Construction Turns The Corner? Homebuilders Getting Optimistic; Higher Home Prices Ahead? 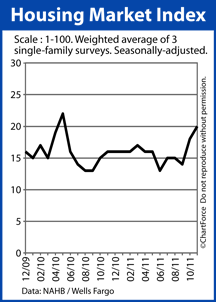 Homebuilder confidence continues to rise. Just two months after falling to a multi-month low, the Housing Market Index surged again in November, climbing another three points to 21. It’s the second straight month that the HMI posted a 3-point gain, catapulting the index to an 18-month. 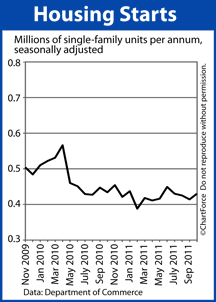 The Housing Market Index is monthly report from the National Association of Homebuilders. It’s meant to measure confidence among the nation’s homebuilders, scored on a scale of 1-100. When homebuilder confidence reads 50 or better, it reflects favorable conditions for homebuilders. Readings below 50 reflect unfavorable conditions. The Housing Market Index has not read north of 50 since April 2006. As an index, the HMI is actually a composite reading; the result of three separate surveys sent to homebuilders each month. The National Association of Homebuilders asks it members about current single-family home sales volume; projected single-family home sales volume over the next 6 months; and current “foot traffic”. And, beyond the headline data, there is an important, noteworthy item in this month’s Housing Market Index. In November, “Current Single Family Sales” climbed 3 points for the second straight month, and is now at the highest point since May 2010 — the month after last year’s home buyer tax credit expired. And, this increase in sales volume is occurring as new home construction is falling, thereby reducing home inventory nationwide. That’s an important point for Rancho Santa Margarita home buyers. With more new home sales and fewer new home listings, prices are likely to increase into 2012. Especially with home builders predicting higher sales levels over the next 6 months, and seeing higher levels of buyer foot traffic through their properties today. For now, though, home prices are stable and mortgage rates are low. This creates low-cost homeownership throughout California , and helps new home construction remain affordable. If you’re in the market for new home construction, the next 60 days may prove to be your best time to get “a deal”. Comments Off on Homebuilders Getting Optimistic; Higher Home Prices Ahead? Tuesday, Fannie Mae and Freddie Mac unveiled lender instructions for the government’s revamped HARP program, kick-starting a potential refinance frenzy across California and nationwide. HARP stands for Home Affordable Refinance Program. 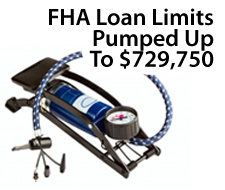 The updated program is meant to give “underwater homeowners” an opportunity to refinance at today’s low mortgage rates. In the two-plus years since its launch, HARP’s first iteration helped fewer than 900,000 homeowners. HARP II, by contrast, is expected to reach millions. Lenders begin taking HARP II loan applications December 1, 2011. If the above criteria are met, HARP applicants will like what they see. For HARP applicants, loan-level pricing adjustments are waived in full for loans with terms of 20 years or fewer; and maxed at 0.75 for loans with terms in excess of 20 years. This will result in dramatically lower mortgages rates for HARP applicants — especially those with credit scores below 740. Some applicants will find HARP mortgage rates lower than for a “traditional” conventional mortgage. In addition, HARP applicants are exempted from the standard waiting period following a bankruptcy or foreclosure, which is 4 years and 7 years, respectively. These two items are inclusionary and should help HARP reach a broader U.S. audience. HARP contains exclusionary policies, too. 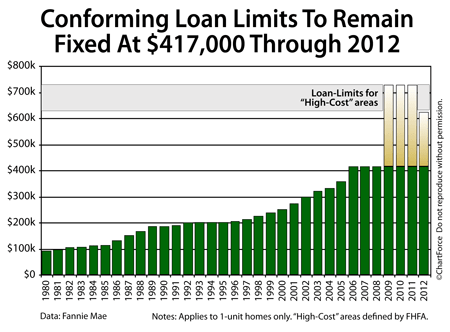 The “unlimited LTV” feature only applies to fixed rate loans or 30 years or fewer. ARMs are capped at 105% loan-to-value. Applicants must be “requalified” if the proposed mortgage payment exceeds the current payment by 20%. And, of course, HARP can only be used once. Fannie Mae and Freddie Mac will adopt slight variations of the same HARP guidelines so make sure to check with your loan officer for the complete list of HARP eligibility requirements.